Movement is a change in the position of an object in relation to other objects. The reference body is the object in comparison with which the movement is observed. There is not an object in nature that is in complete – absolute rest. The path (or trajectory) is the line that the body describes while moving. Paths can be straight or curved, so the movement according to the form of the path is either linear or nonlinear. The linear motion is the most basic motion and is further divided into uniform and nonuniform motion. Accelerated motion is part of kinematics in which changes in velocity during motion are studied. The momentary speed is the velocity of the material point at a given moment of time or at a given point of the trajectory. It is equal to the mean speed for a very short time interval Δt. Acceleration is defined as the ratio of the change in velocity and time interval. If the body stands in place or moves at a constant speed it has no acceleration. From this it follows that the acceleration can be represented as an equation in the following manner. The mean speed is the ratio of the total displacement of the body and the size of that time interval. The mean speed should in no way be calculated as an arithmetic mean of the speeds of the individual parts of the movement. 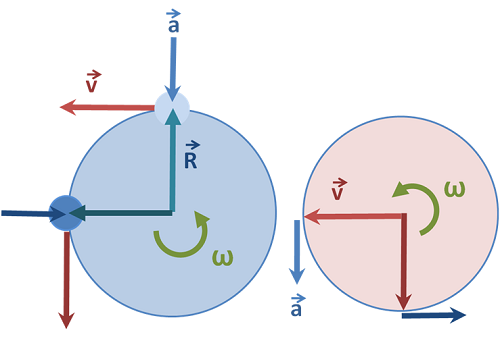 With introducing the mean speed, nonuniform movements are identified with a uniform linear motions. Depending on the acceleration sign, a uniformly variable motion can be: positively accelerated (a> 0) and negatively accelerated (a <0), and in relation to the initial conditions it can be: motion without initial velocity (v0 = 0) and movement with initial velocity (v0 > 0). If one object moves in a straight line and passes equal movements at equal intervals, then it performs a uniform linear movement. Since the speed of movement is determined by the distance in a unit time, the uniform linear motion is a constant speed movement (a=0). In case of uniform movement, the displacements for each second (or other equal intervals) are not identical. In case of uniform movement v=const. ; a=0; in case of nonuniform movement v≠const; a ≠ 0. When talking about uniform rotational movement ω=const, and similarly ω≠const in case of nonuniform motion. Nonuniform movement is such a movement where the body crosses different paths for the same time intervals. Movement along a straight line in which the acceleration is constant is called uniformly accelerated linear motion. The average speed is not equal to the average speed of the object. Such examples are free fall, a car with an engine off, a sphere on a steep level and so on. In case of uniform circular motions the body rotates at a constant speed around a fixed axis or center point. The radial distance is constant. 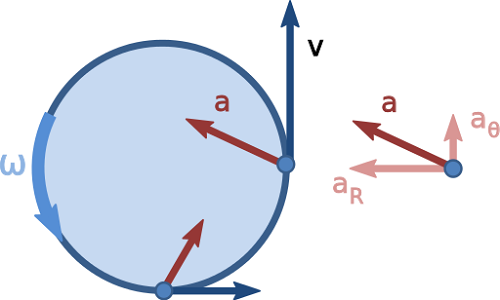 Nonuniform circular motion is characterized with variable angular speed – and there is some radial acceleration. Emilija Angelovska. "Difference Between Uniform and Nonuniform Motion." DifferenceBetween.net. June 15, 2018 < http://www.differencebetween.net/science/difference-between-uniform-and-nonuniform-motion/ >.